Rowing is fun, helps keep you fit and gets you out and about in one of the most exhilarating and rewarding environments there is – on the water. 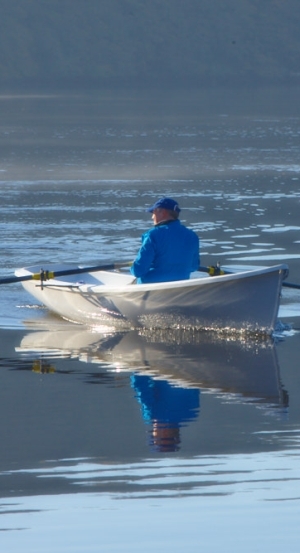 People of all ages, sizes and physical limitations can learn to row and achieve a level of accomplishment that is both physically beneficial and personally rewarding. Rowing is now recognized as an effective means of therapeutic conditioning used in various applications, such as for joggers with bad knees to those physically handicapped. Rowing requires a minimum of skills to achieve, you can learn to row in one afternoon, yet it will remain a challenge throughout the years as you continue to improve and explore the sport. Rowing can be as relaxing or as hard as you like, like a gentle walk in the park or a long cross country hike. Being a non-impact exercise whether you are young or old it provides the ideal environment in which to stay fit and enjoy the outdoors. Rowing combines a full-body fitness sport with a recreational activity, offering a complete physical and mental conditioning program all in one. Rowers can burn 500-600 calories per hour, reduce stress levels, lose weight and reduce blood pressure. You will find that you actually look forward to your next row; simply put it’s a fun way to stay fit. Both competitive and recreational rowing are unique in comparison to most sports in that they exercise all of your major muscle groups. Everything from your legs, back, and arms are engaged while rowing. Most important of all, rowing puts you in a unique and refreshing atmosphere, far from our hectic day to day lives, one that stimulates your senses while challenging your efforts. Rowing creates a unique feeling of satisfaction and freedom, being so close to nature is inspiring and gives an inner calm that is carried though into your everyday lives. Even occasional rowing will help you to relax and enjoy life.